Base class for smoothing algorithms. Smooth tangential and normal direction. Disable error control of the smoother. This function disables the error control of the smoother. Set local error as an absolute value. Set the maximal error tolerance of the smoother to the given value. Set local error relative to bounding box. 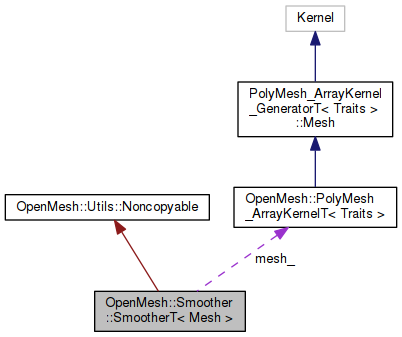 This function sets a maximal error tolerance for the smoother as a fraction of the bounding box of the mesh. First the bounding box diagonal is computed. Then the error is set as the length of the diagonal multiplied with the given factor. 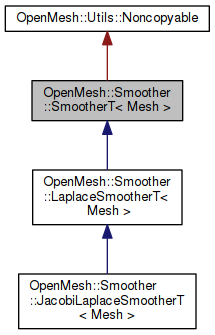 This function can be used to control if features on the mesh should be preserved. If enabled, the smoother will keep features and does not modify them. Features can be set via OpenMesh status flags (request status and set primitives as features). Feature flag can be set for vertices edges and faces.